You are currently browsing the tag archive for the ‘Rigid’ tag. A common challenge for many rigid, anxious, and distracted kids is the tendency to be All or Nothing thinkers. This can be experienced in many ways – with their emotions, social experiences, rules, and with tasks. When you constantly live in a place of All or Nothing and Right or Wrong – it can be easy to become hyper-focused on perfectionism and rigid expectations of external experiences become the norm. The first step towards changing any behavior is becoming aware of current behavior and then examining what other responses exist outside of our usual response map. 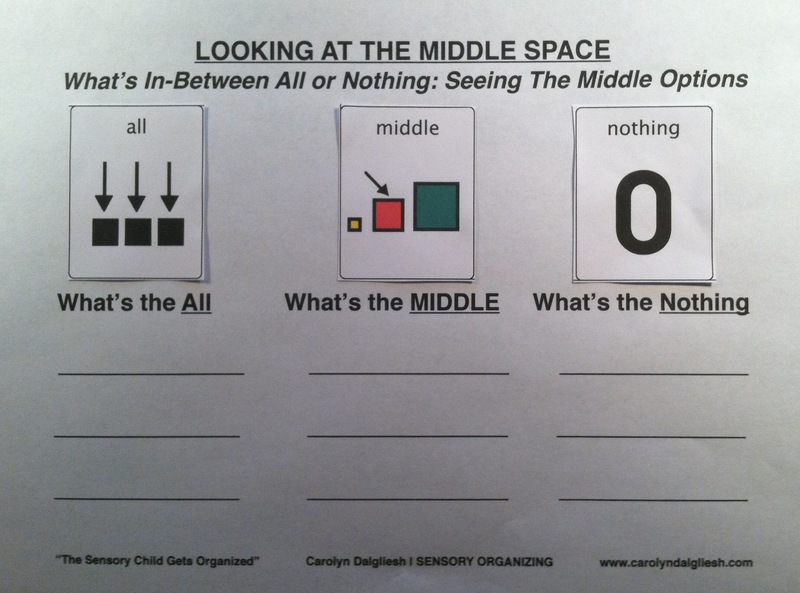 For our sensory kids, this means exploring the space between All and Nothing – the Middle Space. Here’s an example of a simple map to help visualize and work through the new THINKING IN THE MIDDLE SPACE options. Before a known All or Nothing experience, sit down and fill out the 3 different ways that the situation could be handled through the All Lens, the Nothing Lens, and most importantly the MIDDLE Lens. This Middle Space will often have several options to explore, options that might not naturally occur to our sensory kids. Once you explore a few of these All or Nothing experiences through the Middle Thinking lens, you can try to practice them in real life situations. This helps our sensory kids have a visual map of Middle Space responses and also give us parents a map to help guide our sensory kids through a situation with verbal prompts around these new Middle Space alternatives. * Paper and markers or word processor. * Pictures or images that represent All, Nothing, and Middle. * Can laminate and use a dry-erase marker for easy re-use. * Could also make a simple, on-the fly visual using a notepad. 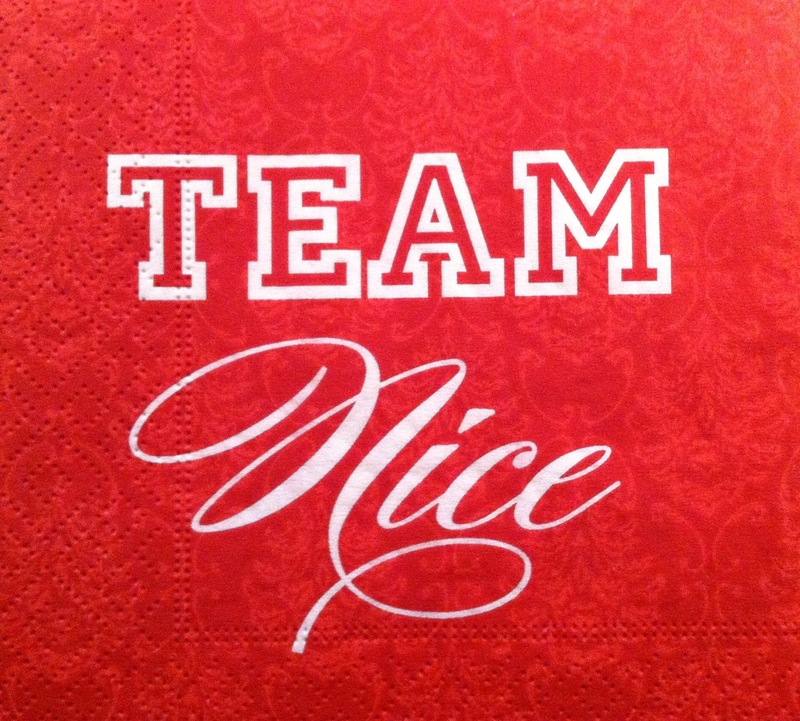 SENSORY ORGANIZING BLOG: GO TEAM NICE! We know the world is overwhelming to you. You often manage big feelings that don’t make sense and a body that doesn’t always do what you want it to do so when you show up each and everyday, that’s already a Big Win. We know that simple things can often be harder for you. We witness how hard you work each and every day to show up and learn despite many external challenges. We are amazed by your effort. We have come to learn how important small victories really are! A mastered task, an expression of a big feeling, taking a social risk, or a focused work session are big wins. You are amazing. We have come to realize that we’re not all that different from you. We have a way of doing things that we think is valuable and important and so do you. We stand on the sidelines with verbal cues and visual guides to support your journey as needed. But our main job is to value your way as much as our own. When we believe and say “You Can Do It”, it means today and everyday. We know that, just like everyone else, you are doing the best that you can everyday. And somedays it’s a much harder journey than others. We won’t give up – we know you can do it today and everyday. We also know that we’ll have hard days too and we’re going to need to be our own cheerleaders and say the TEAM NICE Cheers to ourselves. But that just helps us understand that we’re all connected and all in this together. If we can learn these cheers for ourselves, we’ll be even better at cheering for you. Many of us come into sensory parenting with limited hands-on experience living with and supporting rigid, anxious, or distracted profiles. For many parents, one of the hardest pieces to journey through is learning how to live with and support strong emotions. The goal is not to be “in the strong emotions” with your sensory child but to be able to “be with” or “next to” your sensory child’s strong emotions in support. You know when you are watching a friend’s child and you find yourself in this great space of being able to observe and react without judgement or feeling? That’s where you need to be when your sensory child is in a place of strong emotions. Take a step back (physically and emotionally) because this emotional space is what allows you to be truly supportive. Know the current list of “no return” triggers for your sensory child. There’s usually 2-3 things that, when emotions are high, will push your sensory child over the line. It can be sensory input that is overwhelming, certain verbal prompts, or tasks that are hard for them on a good day. Just know what they are and try to adopt an “off-limits” approach to them in periods of strong emotions. This can be the hardest shift for us parents. 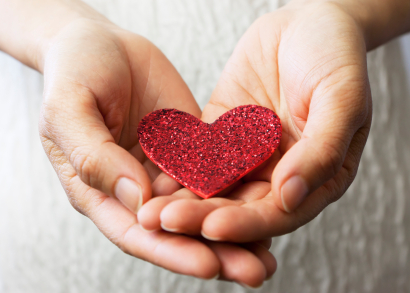 We have been raised to believe that giving into kids is wrong – that the parent is always right. But for sensory kids living with strong emotions, new rules do apply. Most likely, if your sensory child has gotten to the place of strong and unpredictable emotions, it’s too late to discuss, compromise, or negotiate. Letting your sensory child have what they need in an explosive episode can be the only thing that stops the spiral and gives your child the footing they need to get in control again. Though it looks different when it’s anger or explosive behavior (especially in tweens or teens), strong emotions are no different than the child who has fallen and hurt themselves physically. We would have no problem helping a child who is physically hurt and it’s really no different than helping a child with strong emotions. If you need to cut out and frame a picture of a young child crying to help you remember this idea – do it. Learning the parenting road of strong emotions takes practice – LOTS of practice. The important thing is to take a moment after an intense experience with your sensory child to acknowledge what you did better this time. Maybe you controlled your own emotions, maybe you were able to give your child space, or give them what they needed in the moment. Progress is in this arena can feel small but it actually REALLY BIG. So take some time to acknowledge it. When it comes right down to it, we are the same as our sensory kids. When we are going through our own struggles, we just want to be loved and understood. When our sensory kids are in a place of strong emotions, they just want love and understanding. We might be on different roads but we’re all working towards the same goal. Remember that. For many of our sensory kids, the vague or abstract can be difficult for them to understand. This is can also be true around making plans or organizing outings. For some of us, taking a walk outside because it’s a beautiful day makes sense. But for some of our sensory kids, the “why”, “what’s the reason or the purpose” gets in the way. Thankfully, we can create Plans with Purpose to help us put the why and the purpose into our family activities, yearly traditions, and / or weekend outings. The best way to demonstrate this is to give an example. I knew a sensory family whose goal was to do a weekly family activity but just taking a walk or taking a bike ride wasn’t at all exciting or making much sense to their sensory child. Here’s where you can bring in the purpose and tie in something fun and/or a fascination. Maybe your sensory child like planning routes or loves maps. And who doesn’t like ice cream? This was true for this sensory family so they had found their purpose. They called it Frozen Fridays. Goal is to map out and hit most of the ice cream shops in a 30 mile radius over a 2 month period. Each week, tie in a bike ride that ends at the ice cream shop of the week. 1) Identify the ice cream shops. 2) Map out the ice cream shops, plan the order of the ice cream shop attacks, and look for an easy bike ride around the area. 3) Make a Ice Cream Shop Visual that maps out the weeks in your plan and hang in a central area at home. 4) You could even make a rating sheet that could be filled out after each ice cream shop with a vote for best ice cream shop at the end of the summer. 1) It creates a purpose, a goal for the weekly bike rides. 2) Mapping out the ice cream shops and bike rides ties into a fascination for this particular sensory child. 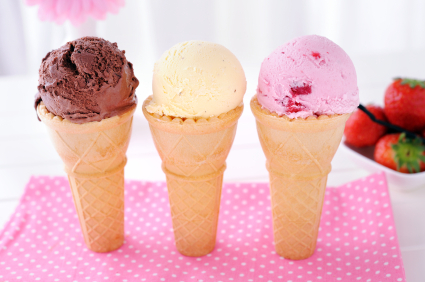 3) There’s a built in weekly reward after the bike ride – Ice Cream! 4) There’s clear cut start and end to Frozen Fridays – when all the ice cream shops have been hit on the map, the project is over. A big part of supporting the Back-to-School transition has nothing to do with school — it happens in the many transitions at home around preparing for school. The morning transition can be one of the more challenging transitions as many of our rigid, anxious, or distracted kids have a hard time waking up in the morning, have anxiety about school in general, and/or know they will be working hard to pay attention and hold it together for the next 6 hours. Our goal is to make their mornings easier so they have more energy and willpower for the experiences where they will need it at school. 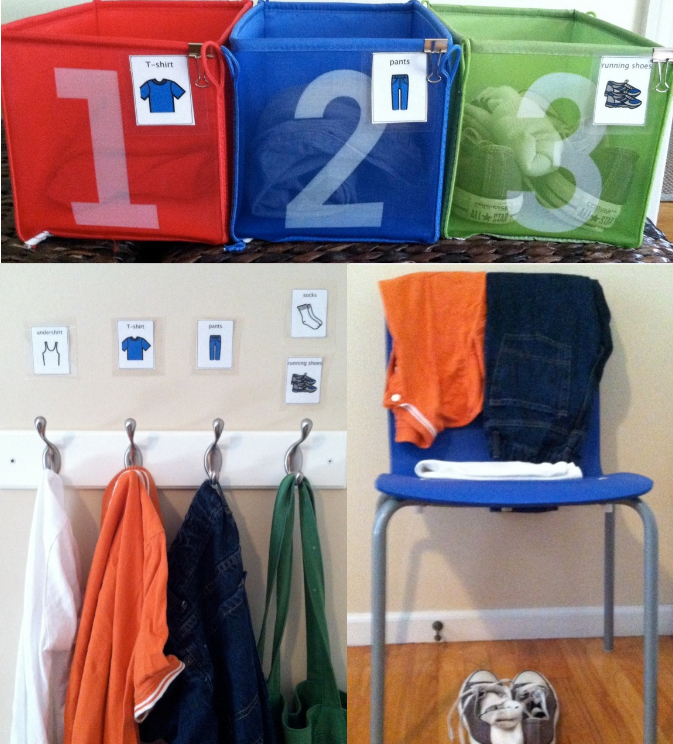 1) Evening Step: Pick out and put clothes in the dressing station the night before (this simplifies the morning and also helps our sensory kids begin the cognitive shift to school coming the next day). 2) Morning Step: In the morning, go to dressing area and get dressed. A dressing area supports many rigid, anxious, or distracted behaviors. – It helps our rigid child simplify a transition to an undesired task (school!). – It helps our anxious child create a routine which will help calm and support their transition to something that might feel overwhelming (school!). – It helps our distracted child stay on task with a simplified, visual plan to complete a task. – It does the first step (and often hardest step for many sensory kids) of gathering supplies into one area and sequencing the task. – We’ve broken down the task into manageable pieces. – We’ve created a visual checklist of sorts with the 1,2,3 Labels / Picture Images. – It can grow with your kids. As they get older, you can remove the visual supports. You can transition from images to numbers 1,2,3 and then to no visual supports besides the hooks or the chair. This works well for younger kids learning to dress and can be portable! 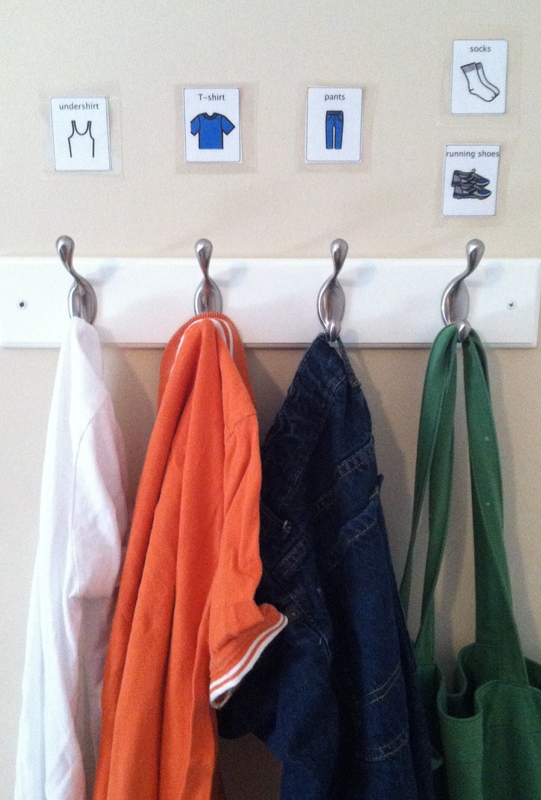 Can use with images, numbers or just have your child hang each item of clothing separately in order. A bag on a hook can hold socks / shoes. You can use duck tape to mark sections on the chair, have a basket under the chair to hold shoes and socks, or just pile everything on the chair (sometimes too much structure is just too much!). *** For kids who might need to tap into the Power of Choice to stay regulated with this task, think about having 2 Dressing Stations – A Hook System and A Chair Station. If they are having a hard time doing step one (picking out clothes the night before), you can give them a choice of which dressing station to use – this might help get them over the hump. 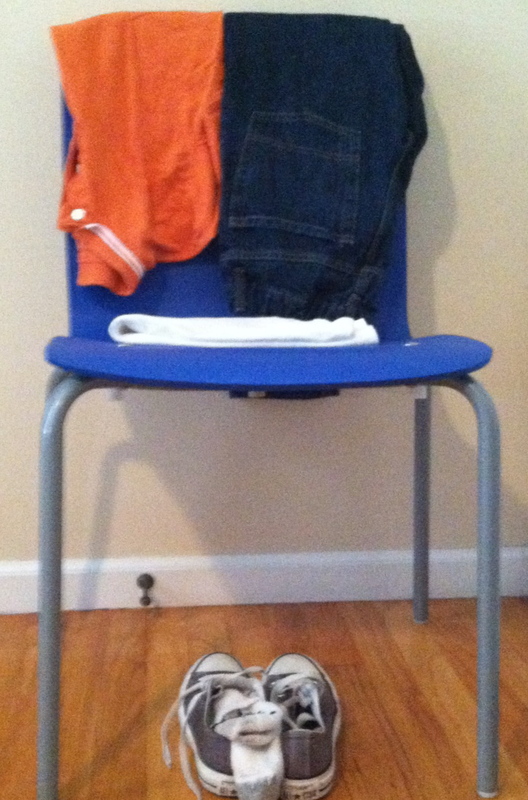 – A Chair: One that has a design of “hook” corners or a flat top is best – 1) undergarments on seat of chair, 2) top on Left side of chair, 3) bottom on Right side of chair, and 4) shoes and socks under chair. – Labels: Adhesive labels for a 1,2,3 visual support if needed. – Small Binder Clips to attach labels to Bins. – Optional: Laminating Machine to protect picture images. Check out Carolyn’s Facebook Page!